Spearheading the call is Independent candidate and respected legal practitioner R. Dancia Penn QC who said she learnt late last night of allegations and concerns expressed in relation to the conduct of the Advance Poll. She has received support from Independent candidates Albert O. Wheatley and Dion M. Jennings, People's Empowerment Party’s Territorial At Large candidate Natalio D. Wheatley aka Sowande Uhuru and, to a lesser extent, Second District candidate and member of the People’s Empowerment Party, Elford W. Parsons. According to a press release from Ms Penn this morning, June 6, 2015, the concerns are about the sealing of envelopes at some polling stations, the handling of the ballot papers, as well as the conduct of certain candidates at polling stations and the disparity of treatment of candidates at different polling stations. “I myself observed what appeared to be active campaigning by a candidate at a particular polling station. This of course is against the law which clearly states how candidates should behave at polling stations,” Ms Penn stated. The former Deputy Premier said the allegations are extremely serious and should be investigated at the highest levels immediately. She added that if the allegations are true, they would be serious breaches of the Elections Act and the Virgin Islands Constitution, of which she is very familiar having been responsible for the drafting of the territory’s principal Election Act in 1994. 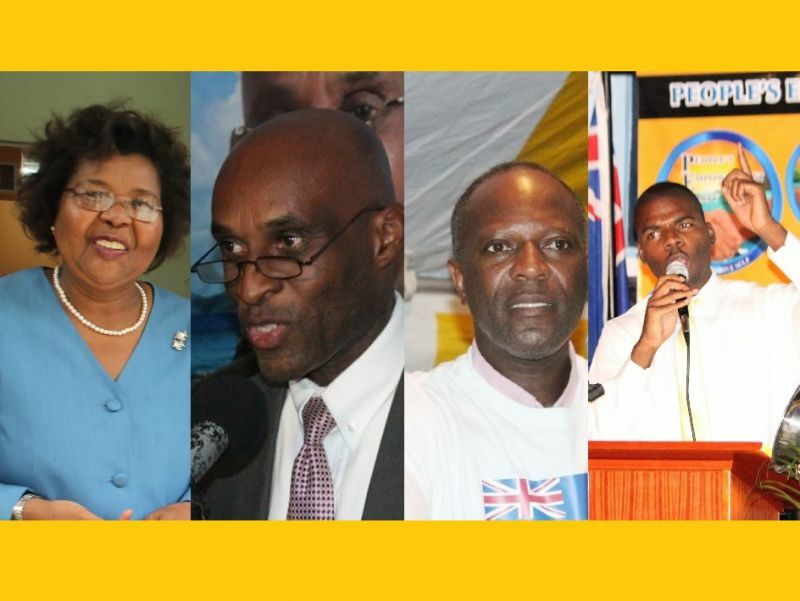 Meanwhile, other candidates have expressed their support for Ms Penn’s call as they agreed there must be public confidence in the electoral system. “I absolutely agree with Mrs Dancia Penn because we need to ensure that we have a fair and proper election process,” Ninth District candidate Mr Albert O. Wheatley stated. President of the PEP, Natalio D. Wheatley said the party has concerns regarding the voting process and wants those issues to be investigated. He said there are concerns that the integrity of the Advance Polling day process could have been compromised and called for there to be investigations into these concerns. Efforts to reach the Chairman of PEP, Hon J. Alvin Christopher, proved futile but Wheatley promised to get a fuller statement after consultation with the Chairman and other members. However, up to post time we did not receive this statement. PEP member and Second District candidate, Mr Elford W. Parsons said he was not aware of the press release sent out by Ms Penn and the issues raised and noted that he could have only spoken about the polling station that he was present at. He said while it is a small community and people go on the premise that everybody knows everybody, if it was announced that ID would be needed then people should have been properly advised at the polling station. The Virgin Islands Party had also raised those concerns about the photo IDs and had even made it known to the Commonwealth Observer Mission. Meanwhile, Jennings said that regarding the integrity of the votes, he has concerns with that because, “we don’t know who is taking the boxes and where they are being kept. They did seal the boxes and they did tape it off but then we don’t know who is transporting the boxes and we don’t know where they are being kept,” he said. Independent candidate for the First District, Preston P. Stoutt said he had no concerns when told of the issues raised by Dancia Penn in her press release. “We were at the Elections Office just now and the voting boxes that we had in the First District, the seals were not broken. They actually opened the boxes in front of us and then transferred the ballots to the envelopes and then resealed them and we signed off, so in my opinion it was transparent in the First District. Mr Stoutt had previously questioned the fact that incumbent Hon Andrew A. Fahie had garnered 611 votes in consecutive elections and had said even a professional gambler would not have betted on those odds. Stoutt had also appealed for election observers to pay particular attention to the First Electoral District. Members of the Virgin Islands Party (VIP) had since yesterday expressed concern regarding the sealing of envelopes containing ballots from the various polling stations following the close of Advance Polling. Several candidates, according to information reaching Virgin Islands News Online, had lodged a complaint to the Office of the Elections Supervisor regarding their discomfort over the issue. According to President of the VIP, Carvin Malone the VIP agents are not satisfied with the manner in which the envelopes containing ballots were sealed, especially that the permanent seal was allegedly done with scotch tape "and the agents were saying that they were not allowed to sign on the seal to ensure that it is not lifted. As a result of that they are very much not in favour of the way in which this process took place." Mr Malone had further said concerns were previously raised about envelopes containing ballots being held at the Office of the Elections Supervisor. He said while the party is not accusing anyone of anything there remains a possibility that envelopes containing ballots could be tampered with. "It has always been an area of concern," Mr Malone stated. It was also reported that agents of the National Democratic Party also visited the Office of the Elections Supervisor yesterday, however, it is not clear whether they shared similar concerns. Meanwhile, efforts to reach the Supervisor of Elections, Juliette Penn, were not successful up to post time. Ms Penn is slated to update the media on Advance Polling Day matters at 2pm today, June 6, 2015. Police need a VIP Govt. We run things---no investigation--Shut up ! Polo Ice, speak for your self and if you are a Police you sound like a bad apple..dont mess me up. HEY-----wow--to be a VIP now makes one a bad Apple--The bad apples would be the ones who wants to take away ones right to choose--Think about that! In addition to the allegations of ballot tampering, at the advanced polling stations several candidates were seen talking extensively to persons coming to vote. At the House of Assembly, the incumbent could be seen, over a period of several hours, hob-nobbling with individuals. Were these encounters innocent, friendly, or a case of politicking? Who knows!!? There are rules in place which are meant to be followed. When those who are supposed to uphold these rules blatantly break them, then the public should stand up and speak out against such behavior. In the 4th, it was not just the incumbent who should be held accountable but also the person (Election officer) who was seen to violate the rule. One voter raised the issue of candidates mingling with voters to that Election Officer. But, it was obvious that nothing was done to rectify the situation as hours later that same candidate was, so to speak, rubbing shoulders with the folks. A candidate in D4 is said to have been plying the people who came to vote with bottled water all day. Is this proper behavior? Is this democracy? Should a candidate who appear to be obviously campaigning in the immediate vicinity where voting takes place not be disqualified? Should the Election Officer who obviously overlooks or ignores infraction of voting regulations not be asked to step down? How can the people of the BVI stand for such behavior? It is also said that in the 4th, the individual accompanying an elderly lady was told that he could not go in with her. To the extent that this is so, is this not another instance of blatant violation of established rules and regulations? Was this elderly lady denied her right to be accompanied because she is a close relative of a VIP candidate? Are the voters that foolish to not see the absurdity behind what is taking place? Wake up! Wake up!! Action Man was allowed to get away with too much.....PAY ATTENTION MISS ROMNEY! Police is the x factor in this election---they want Morris out----Police votes are VIP secret weapon--Be careful NDP. All kinda stupidness happened yesterday. RoadTown was "everything goes" and i heard that the VIP candidate wasn't allowed in the Long Look polling station. Mister was campaigning in the roadtown line. This is true, I was at the 7th District Polling Station and she came and the Police ask her to leave, so she left the polling station. It will be nice to know exactly what the rules are. Concern might be accepted only if you are talking the truth. I found that as of yesterday you all are making up stories to suite yourselves. God is a good God and he does not work for people who are saying and doing things that will capture votes. Do you have evidence to disprove what people are saying? I AM WITNESS TO THE FACT THAT A D4 CANDIDATE WAS, FOR HOURS... TALKING AND SITTING WITH VOTERS, ACTING AS IF THEY WERE ON THE CAMPAIGN TRAIL. THE ELECTION OFFICER DID NOTHING ABOUT IT. THE POLICE SAID HE COULD DO NOTHING BECAUSE WAS UP TO THE PERSON IN CHARGE.... SHE DID NOTHING. MS DONOVAN-GLASGOW YOU HAVE FAILED TO DO WHAT IS EXPECTED AS ELECTION OFFICER. YOU HAVE TARNISHED YOUR REPUTATION. THE REFINED GENTLEWOMAN WE THOUGHT WE KNEW MUST HAVE BEEN A PUT ON. RESPECT GONE!! MS PENN. LAST YEAR THERE WAS NO SUCH TOM-FOOLERY TAKING PLACE AT POLLING STATIONS. YOU ARE EITHER IN DENIAL OR JUST PLAIN LYING OR TAKING THE LINE-OF-LEAST-RESISTANCE! YOU PEOPLE WHO PRESUMABLY ARE NDP SUPPORTERS YOU SHOULD HOLD NDP CANDIDATES TO THE HIGHEST ETHICAL STANDARDS. ALL CANDIDATES, ELECTORAL OFFICERS, AND THE COMMON PERSON SHOULD BE HELD TO ETHICAL STANDARDS. THE VIP, PEP AN INDEPENDENTS SHOULD NOT CEASE FROM DEMANDING AN INVESTIGATION. IT IS OBVIOUS THAT SOMETHING STINKS... ! IT GOT TO STOP!!! Them better don't mess with that sea cow's bay box!!! THEY BETTER DONT HOG CITY! THEY BETTER DONT!!!!!!!! @ Truth Teller, I agree with you 100% and you are not lying or making up any story. M**** was seen mingling and soliciting support from persons in the line yesterday. He also had his bloc boys doing the same and trying to induce persons with the handing out of bottle water. This behavior is unbecoming and show the lack of confidence and desperation on the part of M**** who has campaign vigorously but still not allowing the process to take its course. I will hope that come monday, candidates and their agents will pay very close scrutiny to the process especially the counting of the ballots. It appears to me that some people will stop at nothing to ensure that they stay in power. If someone's vote can be swayed because they are provided a bottle of water while waiting to vote then the entire campaign is a waste of time. Just put your name in, don't say anything until election day and show up with coolers full of cold water. Cheapest election campaign ever! Seriously, give people credit for having a brain and using their intelligence to decide which way to cast their vote! If it is wrong to be there on election day then there are things that can be done. Whining isn't going to win an election. I hope they don't through Bertie box from the Valley in the sea again like last time. Bertie box needs to go in the sea!! He's not going in. We voting for Albert or All Out! And what a massive loss it will be. (2) At the New office location Ballots will be secured in a Vault the meets and surpass bank vault standards with an electronic and manual locking system. (5) This Request would be made via the Attorney General's Office for the counting. (7) The with a view to go to the Electronic voting machines the data will will be collected in real time and results would be available at the closing of the Poling Stations at a central data collection system. Training will be required for voters two years before Elections will be constitutionally due. Anyone with ideas should make suggestions to make the transition smooth. Where were/are the observers??!!! Is there not supposed to be at least one at each station? Someone said that only 6 came. If there are only 6 why ask for observers when obviously all stations will not be covered. This election is beginning to smell to High Hell! The number of persons that might be implicated in allegations of FRAUD is growing, growing, getting out of control. You people watch it. Remember that the BVI is still a colony. Don't be at all surprised if the UK takes over. Then who is responsible?!! Can't say its just the NDP or its supporters. I think that, more than anything, the people who are content to idly sit by waiting for things to change or believing that it is not going to affect them. People who are so aware of all the BS going down. All you good, fine Christians, who on Sunday put on your best and say you go to worship but can't even try to stand up for justice and righteousness YOU are equally, if not more guilty than those who can be easily pointed to! Beware the seeds you sow!! They observers are only there to observe the process not to stop the wrong, report or tell on anybody. All will be stated in their final report. Struppsss...allu jokey...who the hell can be bought with a bottle of water...Nonsense!! Obviously half of the voters blogging here vote based on a chat, handshake and a bottle of water on polling day. I recall standing in a line at the polls in the fourth last election and was greeted and shook hands with both candidates and got water as I stood in the line. Had no bearing on my choice. Lawyer for hire--WoW!--- Good info--If this is true---Why VIP didn`t jump on this as a campaign issue--This is a winning message.